Studio(s): Sweet Chariot Productions, PlayNow enterprise, Tycor International Film Company. Cast: Vivica A. Fox (Mrs. James), Charles S. Dutton (Coach James), Pooch Hall (Coach Vonner), David Banner (Royce West), Reginald C. Hayes (Mr. Russeau), Robert Hayes (Gary), Aundre Dean (Derric), Lynn Andrews III (Keith). 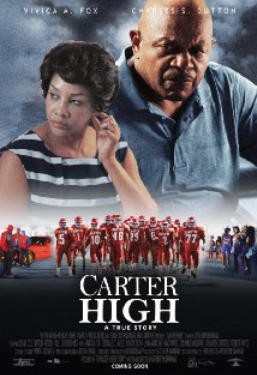 Story: Carter High is the emotional, gripping and ultimately uplifting true story of the powerhouse 1988 Carter High School Football Team from Dallas, Texas. Carter has to overcome tremendous difficulties to reach their ultimate goal of winning a state championship. As parents and community leaders come together to support the youth through their hardships, the team becomes the hero of the community. The film is being produced by former Dallas Cowboys and Oakland Raiders defensive end Greg Ellis and directed by former Carter player Arthur Muhammad. Source: thecarterhighmovie.com (official site); IMDB. This entry was posted in Upcoming Films and tagged Based on Actual Events, Charles S. Dutton, David Banner, Drama, Pooch Hall, Sports, Vivica A. Fox by blackcinemaconnection. Bookmark the permalink.